The PLBV series is the standard product of Primet bellows valves. It is SUS316L product of forging. It is compatible with three types of coupling: union, flange and welded tube end. 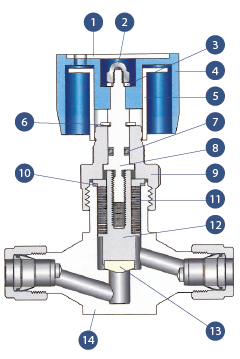 The Primet mini-bellows valve, PSBV series, uses the machine-processed SUS316L for the main body. In addition, its bellows are also made of SUS316L and the valve structure is designed to be hermetically sealed. It is compatible with four types of coupling (metal seal, doble ferrule, weld and union). The bellows valve of Primet has an excellente air-tight structure to protect the portions making contact with the fluid (media) from the atmosphere in order to make the screw-type stem corrosion-inhibitting. 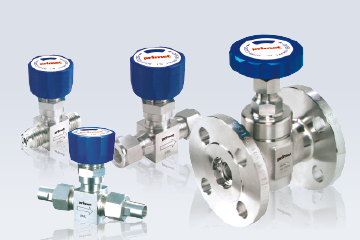 The compact type of PSBV series has the main body made of SUS316L; and the orifice diameter ranges from 4.5mm to 12mm. On the other hand, the large-sized PLBV series has the forged body and the size varies from 8mm to 20mm tobe suitable for large quantities of flow.